Home » Featured » Farm Rich Review and Giveaway! Farm Rich Review and Giveaway! Ever have one of those days/nights where you’re just too tired to cook? When you’ve just had it, and you’re ready to make the trip through the drive-thru? Before you grab the keys and head out the door, consider Farm Rich. Farm Rich is a company dedicated to busy moms. Farm Rich is committed to providing wholesome, easy-to-prepare snacks that the whole family will love and enjoy. In a house with four kids under six, dinner time is usually pretty crazy! I’m helping one child do homework while feeding the baby. I’m keeping the 16 month year old amused with stacking blocks while searching for The Fresh Beat Band on tv. When I throw dinner preparation in the mix, you can imagine the chaos…It’s hard work being a mom! Farm Rich came along at just the right time for our family! We tried the Farm Rich Meatballs AND the Farm Rich Cheese Sticks. Wow. Both products were not only super simple to prepare, but they tasted great as well! 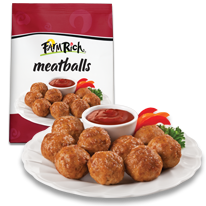 The Farm Rich Meatballs are awesome, and the perfect thing to have on hand. These are the perfect thing to pull out of the freezer on a busy weeknight or the perfect appetizer to whip up and bring to a party or get-together. Throw these on top of spaghetti, simmer in a crockpot full of bbq sauce, or serve in a creamy gravy with mashe d potatoes and lingonberries…You really can’t go wrong! (I also love the option of cooking up just a few at a time, and serving them to the kids for an easy and nutritious lunch!) These meatballs are impossible to mess up and are far superior to other frozen meatballs on the market. Everyone in my family loved these meatballs. I couldn’t cut them up fast enough for my 16 month old! 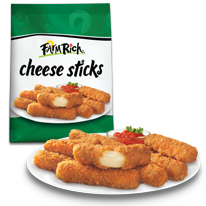 My kids just HAD to try the Farm Rich Cheese Sticks as well. Talk about ooey, gooey, cheesy deliciousness! Again, I love the option of pulling out just enough for one meal/snack, and keeping the rest ready to go in the freezer for another day. We loved these just dipped in our favorite marinara sauce, and served them with some Parmesan chicken. This was a really fun side dish alternative, especially for my cheese-loving children! I love that they are made with 100% real Mozzarella cheese. You won’t be disappointed with these tasty treats! Farm Rich really has you as the mother in mind as they even provide RECIPES on their site! You don’t even have to think up what to do with their products….they’ve done that for you! They’ve provided lots of great ideas of ways to deliciously utilize their wide line of products! Check out their FULL LINE of products HERE!!! What product will YOU buy?? TWO lucky Chasing Supermom winners will get to sample a product from Farm Rich for FREE! I am giving away two coupons for a FREE Farm Rich product of your choice! Good luck!! The stuffed pretzel bites looks great! I’d like to try the philly cheese steaks. I would buy their mozzarella cheese sticks!! They are my favorite!! I’d love to try the mozzarella sticks!! I’d get the cheese sticks. They are great snacks. I would buy the Cheese sticks. I have purchased them previously at my local Kroger affiliate store. I’d love to try the mozzarella pretzel bites! Nice giveaway. Thanks. I think I’d get either the Mozzarella bites or the Cheese Sticks. Love the mozzarella sticks. Thanks! i would probably buy the meatballs or cheese sticks they seem to be on my grocery list every trip! I love their french toast sticks!! I would get the cheese sticks. I love them dipped in ranch dressing. i’d probably get the meatballs and make cranberry meatballs. Sounds yummy already! I would get the Mozzarella Bites. I’d try the stuffed pretzel bites or cheese sticks… or both! All 4 of my kids love cheese so would have to go with the mozzarella sticks.Thanks!